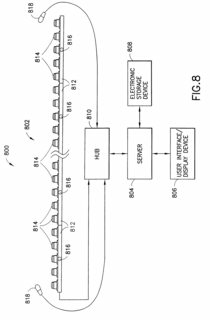 This patent covers the hardware design of a multi-camera array of video cameras making up a spherical or 360º panoramic video system. The whole idea is fairly obvious and already exists in a number of commercial systems, so I'd like to know if anyone would be able to help to post concrete examples of prior art here which can show as many of the claims as possible as not novel or obvious in this patent application. There are a few 360º panoramic video cameras already on the market, including the Ladybug http://www.ptgrey.com/products/ladybug3/Ladybug3_360_video_camera.asp Geonaute http://www.geonaute.com/camera360/ Sphericam http://www.sphericam.com and others. saving the spherical video file to a system memory. The Panoptic camera out of École Polytechnique Fédérale de Lausanne in Switzerland fits the bill pretty nicely. 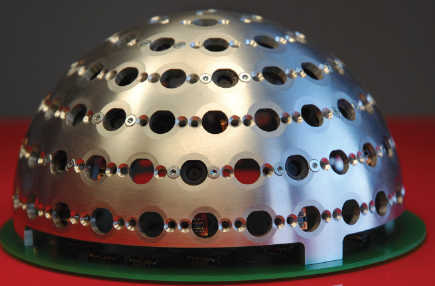 It has over a hundred cameras with specialized hardware to create stereoscopic omnidirectional video in real-time. Very cool stuff. It seems that work started on this in 2009, which is before the priority date, but there have been papers are recently as 2013, so not everything here may be prior art. I like the swiss Panoptic camera mentioned in here. It covers most of the claim elements well. However, I think it misses the audio component. Concentrating on the "audio" part, here are references to combine with the Panoptic camera (or other panoramic camera devices). US Pat. No. 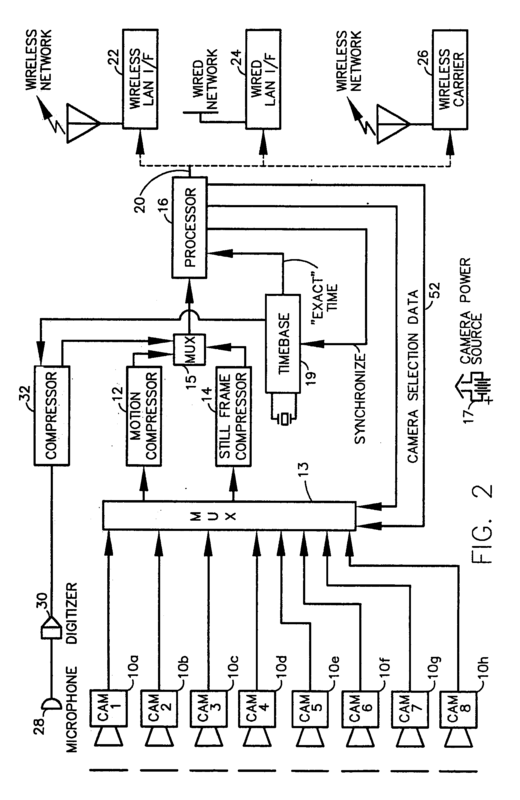 US 6097429 to Seeley, filed Aug 1, 1997: "Site control unit for video security system"
US Pat. No. 7023913 to Monroe, filed Jun 14, 2000: "Digital security multimedia sensor"
The digital camera for collects an image from one or more image transducers, compressing the image and sending the compressed digital image signal to a receiving station over a digital network. A plurality of image transducers or sensors may be included in a single camera unit, providing array imaging such as full 360 degree panoramic imaging, universal or spherical imaging and field imaging by stacking or arranging the sensors in an array. The multiple images are then compressed and merged at the camera in the desired format... (Abstract). US Pat. No. 6522325 to Sorokin: "Navigable telepresence method and system utilizing an array of cameras" granted in 2003. See for example Fig. 8, where an array of cameras and two microphones (818) are shown. Output of cameras and microphones is combined in a hub and sent to the server (804 and Fig.9, 902). See column 16. This reference might prove that is was obvious at the time of the invention to add audio to a multi-camera system, e.g. for telepresenting. Panoramic Photography has been around since the earliest of times when photographers stitched together negatives to create a panoramic image. Sometimes, in art exhibits you would see a complete 360 viewpoint by the photographer printing individual prints and posting them up onto the spherical room walls and ceiling. As the digital age came about, photographers were able to use software to stitch together their images (i.e. photoshop) and create the panoramics that way. As Video came about, 360 degree video became available to the public to create and view. Multiple cameras have been used for a long time in the iMax theaters to create completely immersible experiences for the viewer - first with limited nature films and now with full length feature films. As far as video goes, May 25 2007. Google has effectively done spherical video with their street view program. It's effectively a video with a low framerate, and manual framerate advancement of a car driving around the city. During patent prosecution, claims can change drastically and then they differ from the patent application publication. In this application's file wrapper you find an amended (2013-07-01) set of claims right at the top of the document list. saving the media file to a system memory. Many panoramic cameras have already been described in previous comments, most if not all of them existing before the patent application. According to me it is a non-sense to claim such patent. Not the answer you're looking for? 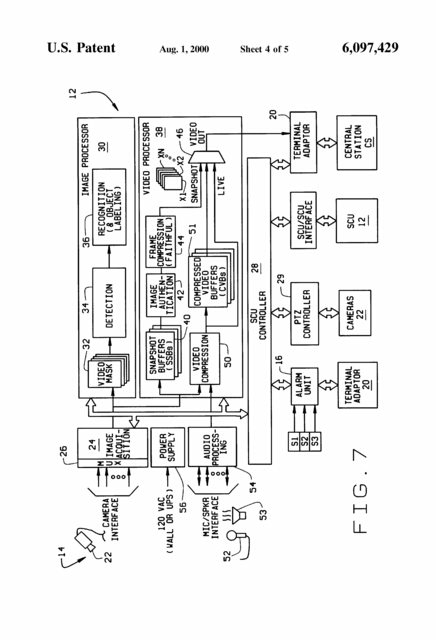 Browse other questions tagged prior-art-request patentability software video us20120206565 or ask your own question.